We had a question from a school that bought a set of Feisdress patterns that brought up the issue of continually re-using the same pattern pieces. Susan and I have one way – we glue the pattern pieces onto poster board (me) or manila card stock (Susan). 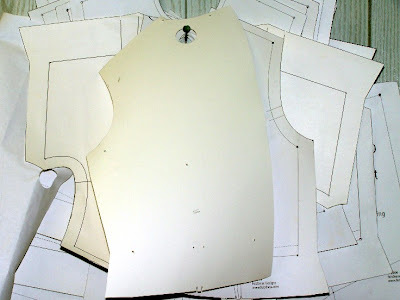 This obviously makes the pattern pieces very stiff which means they stand up to repeated use and they are easy to use when making new altered pattern pieces for different dancers. Here is one group of my darted bodice pieces. I am showing the back side so you can see the holes and notches I punch in them. The big hole at the top is obviously for hanging either directly on a nail or hook or to suspend from pattern hooks (I use them but do not seem to have a pic). 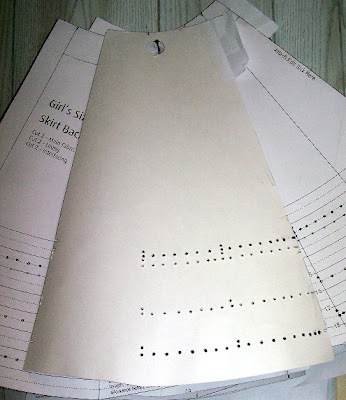 The other small holes are punched with an awl and are necessary to draw the seam and length lines I need to alter the pattern and for correctly marking the cut pieces for embroidery. You can also see the holes and notches for the back dart. This is the back side of a front side panel. There are notches at the top that correspond to holes at the hem to guide correctly marking the panel center lines and pleats. The hem is also marked on the individual hem lines so I do not have to have a new pattern piece for each hem length in every single skirt size…I think I would lose my mind if I had to keep track of so many pieces! Here is an example of a set of patterns that have been altered and transferred to tissue paper. I like tissue paper the best for making a new set of bodice patterns for specific measurements, although I also use marked pattern paper when I run out of tissue. These are hanging from a pattern hook that seems to have blended into the wall! 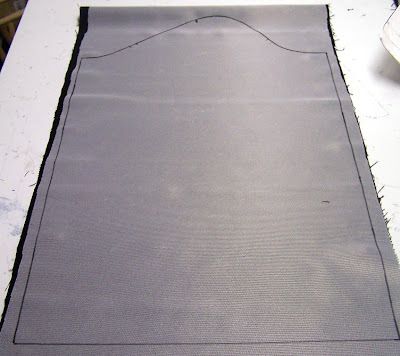 Cutting the bodice: Once I have made the custom bodice pattern, I do not pin it to the fabric. Pet peeve of mine because pinning does change the shape a bit and pulls the fabric. So I lay the pattern on the wrong side of my interfaced fabric and trace the pattern piece directly onto the interfacing. (I use fusible interfacing on every single piece of fabric in every dress. Here I have used french fuse.) I use permanent ink, but since I cut just inside the line, there is very little left on the piece itself. This is a back bodice piece that will not be embroidered so I do not need any other markings here. I will wait to mark for darts and sleeve notches until I have attached the lining. When I cut out the front bodice for this dress, I do mark the center front line on the interfacing for embroidery placement. 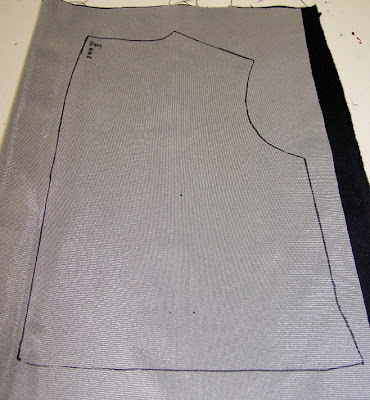 Cutting the sleeve: Here is the traced sleeve. Barring an armscye having to be so altered that I would have to create a new sleeve pattern, I can just use the pattern piece on the poster board and easily & quickly trace around the hard piece. I have different sleeve lengths marked on my piece so I can cut the correct length. Cutting the skirt: I do not make new tissue patterns for the skirt. 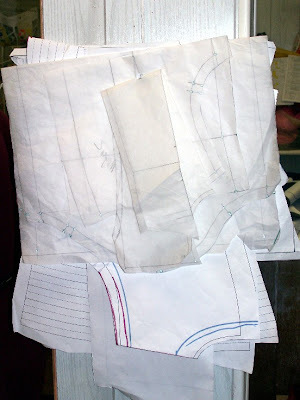 I use the hard pattern pieces and lay them directly on the interfaced fabric. The center front panel is only one piece and I mark the hem throught the holes punches on the hemline. I mark the center line and the pleat lines on the interfacing for embroidery placement. The front side panel, side tuck, and back skirt are 3 separate pattern pieces but are combined to make one piece (see here for illustration). If there were no changes to the waist of the bodice, then I simply combine the three pieces at the correct hem line and trace it all onto the fabric: hemline, pleats, and center lines for embroidery placement. If there were changes to the waist width of the bodice (usually enlarged), then I adjust the pieces easily using the tuck as the stationary section and moving the FSP and/or back skirt away from the attachment lines on the tuck. Thank you, Katherine. I have to admit that each time I see I need to moderate a comment that I get a jolt in my stomach thinking it might be a comment about what a tupid post I put up! So thank you for such a nice compliment. And then I go and post without proofreading…”tupid”!